The City of Pittsburgh sent out the following press release at 12:50pm. There has been an amazing response from the public to assist. We do not need any further donations. Also, Toys For Tots has stepped up with a $10,000 donation to replenish toys. Please express our heartfelt gratitude to the public and let them no that no more donations are required. We will be in touch with additional details when possible. 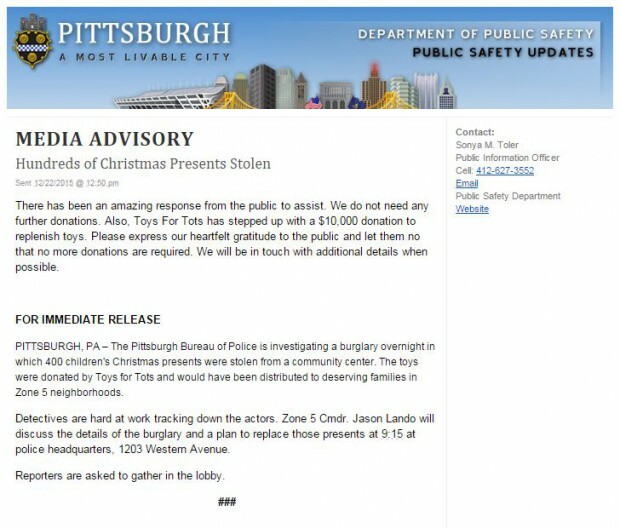 PITTSBURGH, PA – The Pittsburgh Bureau of Police is investigating a burglary overnight in which 400 children’s Christmas presents were stolen from a community center. The toys were donated by Toys for Tots and would have been distributed to deserving families in Zone 5 neighborhoods. Detectives are hard at work tracking down the actors. Zone 5 Cmdr. Jason Lando will discuss the details of the burglary and a plan to replace those presents at 9:15 at police headquarters, 1203 Western Avenue. Reporters are asked to gather in the lobby. Early this morning, I was forwarded the following email from Officer Jason Lando, who is the Commander of the Zone 5 Police Station overnight from a Pittsburgh friend who happens to be out of the country, but wanted to see if there was any way to help. The same message was also posted on the Zone 5 Facebook page here. I was hoping and holding my breath that we would not have to use the #pghsavesxmas hashtag this year. I had spent the weekend following up with some of the groups that we were able to help last year to make sure everything went smoothly with toy drives this year. 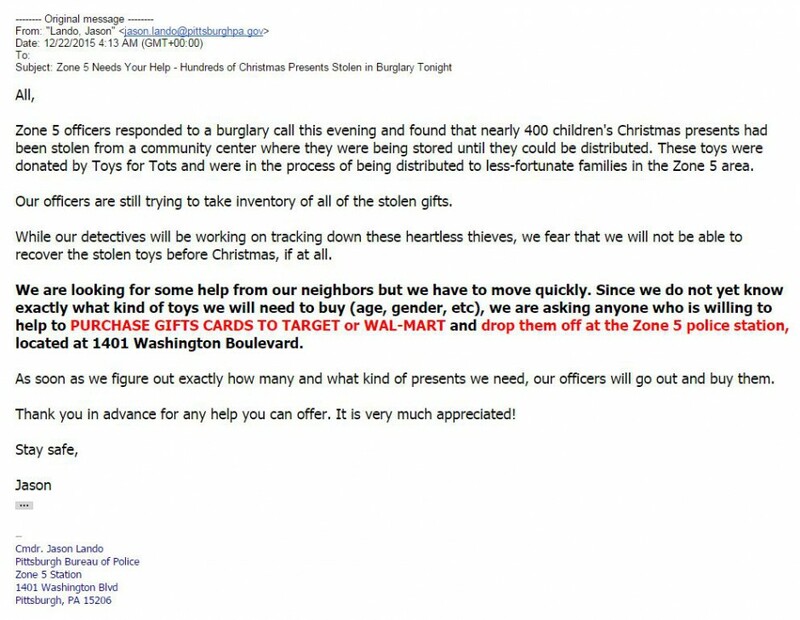 But last night, toys for over 400 children were stolen from a local community center. Commander Lando is asking for donations of Gift Cards so that police can quickly replace stolen items in time for the holidays. One of the things that we learned last year doing the toy drive is that we never had enough toys for older kids, so gift cards are a good way to help because officers can buy exactly what they need.